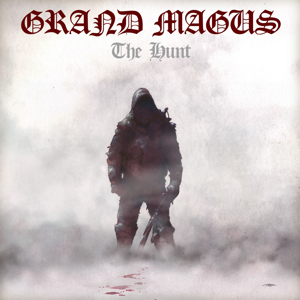 Swedish heavy metal trio Grand Magus recently released their sixth full-length studio album “The Hunt” on Nuclear Blast Records, an album that sees the band get stronger in their musicianship and move successfully forward from previous albums such as “Wolf’s Return”, “Iron Will” and “Hammer Of The North”. ‘Heavy Metal’ is just about the best way to describe their music, because it’s hard to put a finger on a particular style and label them like that. The music contains elements of stoner, doom and power metal, but more importantly, it boasts of great vocals and extremely solid riffs, which is what makes “The Hunt” an album all heavy metal fans can relate to instantly. 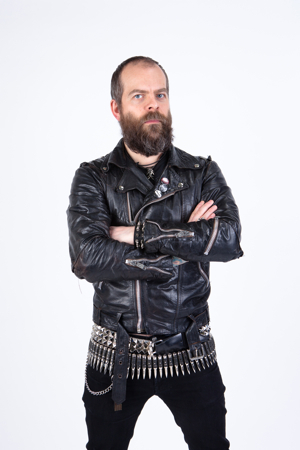 A couple of days ago, I caught up with vocalist/guitarist Janne “JB” Christoffersson to talk about this album. Read the conversation below, check out the title song off of “The Hunt” using the YouTube player, and visit the band’s facebook page for more info. First of all, the new album sounds awesome. You’ve always brought different elements and musical styles in your past albums, but I think this one is more of a straight-up metal album. Would you agree with that? You know, I’ve heard so many different responses to “The Hunt” that I’m not even sure myself, haha. For me, it’s definitely a straight up metal album, but in the way it used to be in the early eighties. Instead of doing very streamlined stuff, there’s variation and a focus on songs rather than sound. Musicians and critics often talk about musical evolution. But do you think evolution can also mean getting stronger at the basics like guitar riffs rather than just getting more complex with the musical arrangements? Yes, definitely. Refinement is the key. I think that most people start out trying to play the most technically challenging things they can, you know? Like when you’re fifteen you do these sprawling epics with 100 chords and tempo changes. To play the basic stuff with groove and feeling while at the same time project the power is the most difficult thing, and that’s what we’ve been working on since we started this band. Besides the music, the vocals are sounding killer. How would you compare it to the vocals on previous albums? Maybe more relaxed. I think in the past there have been elements of uncertainty and stuff where I didn’t really hit the mark, you know? That gives things a feel of its own though, it’s not necessarily a bad thing, but I feel more confident now than in the past. Do you think the production also has a role in giving the album a 70s rock type of sound? Yes. It’s weird though, because that’s not something we were talking about per se. I guess when you avoid triggered drums and sound replacements etc., it sounds more old-school. The Hunt is strictly miked up drums and amplifiers, nothing else. I guess that’s pretty rare these days. What’s your writing process like? Is it mostly done by you, or is it more of a combined effort by everyone? We usually write most of the framework together, jamming. On this album with the drummer situation, things were done a bit differently and there are more songs written just by me than on previous records. In the shows that you’ve done after the European release of the album, how have the crowds received the new songs, and which ones are you enjoying playing the most? It’s been a great reception, almost that they’ve heard the album for years, singing along to the lyrics you know. Valhalla rising is definitely the new live favourite. Also Sword of the Ocean and the title track work great live. You’ll be doing more shows in Europe, including summer festivals. But do you also plan to visit North America to promote the album in that territory? We’ve actually confirmed our first transatlantic gig – on Calgary, Canada in September. Hopefully more to follow. We’ve never played in the US so it’s about time! You did some dates with the legendary Accept last year. How was that experience? I’m sure their crowd would have loved your style of music. It was fantastic. To be on tour with your heroes is a dream come true. They were awesome guys as well, and of course killer performers. I’ll treasure those gigs as long as I live. I think we were a great combination too. If I ask you to name a band you would dearly love to tour with, what name comes to the top of your mind? You have been putting out albums very regularly, with a new album every two years. How do you manage to put together new material so quickly despite all the touring you have to do? Do you write while you’re on tour? I don’t know man (laughs). No, we don’t write on tour. We have to have time dedicated to writing. I honestly don’t know how we’ve managed to be that efficient … maybe it’s Oden’s work!